Almost 1,500 participants from 77 countries are currently in Lisbon, attending the World Meeting on Sexual Medicine, organized jointly by the ISSM and the European Society for Sexual Medicine (ESSM). 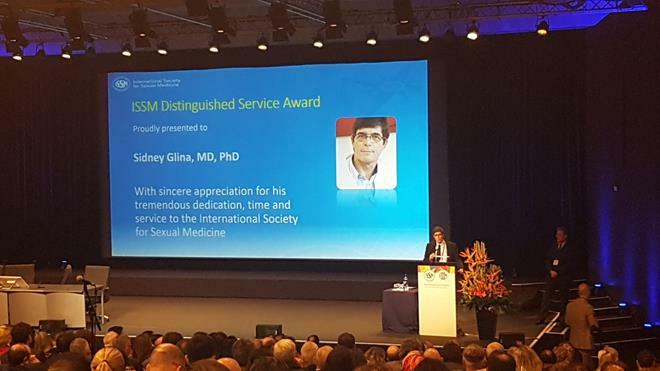 The opening ceremony took place yesterday, and Sidney Glina was awarded the Distinguished Service Award for his tremendous dedication, time, and service to the ISSM. In addition, Wayne Hellstrom was awarded the President's Leadership Award in appreciation of his outstanding service as ISSM President from 2014 to 2016. The ISSM Business meeting, along with elections for the ISSM Board of Directors, took place this morning. We congratulate Annamaria Giraldi as President-Elect, Arthur Burnett as Treasurer, and Sharon Parish, Johannes Bitzer, and Yoshikazu Sato as Members at Large. Please click here for more meeting news! Scientists have determined that two specific medications do not impair a man's erections, according to new research published in the Canadian Journal of Cardiology. The drugs are rosuvastatin, a statin used to reduce cholesterol and candesartan with hydrochlorothiazide (HCTZ), a combination drug used to lower blood pressure. The researchers conducted a randomized, controlled trial involving over 2,000 men. The participants completed the International Index of Erectile Function (IIEF) at baseline and at a follow-up point years later. There were no significant changes in IIEF scores. The drugs, used alone or together, did not improve or worsen erectile function. "The Multiple-Slit Technique (MUST) for Penile Length and Girth Restoration" by Drs. Paulo H. Egydio and Franklin E. Kuehhas was published online in December in the Journal of Sexual Medicine. The study discusses the outcomes of 138 men who received penile implants via the multiple-slit technique. The patients were followed for six months. Please click here to see the full summary. The World Meeting on Sexual Medicine wraps up tomorrow, and we thank everyone who was involved in making it a great success! If you could not attend, you can still get information on the latest research and happenings through social media. Just search for the hashtag #WMSM18 on both Twitter and Facebook. Clicking on that link will show you all the available posts related to the meeting. We look forward to bringing you a recap of the meeting soon!